Cap 5-11 cm broad, ovoid, becoming convex, then nearly plane, margin conspicuously grooved or striate; surface viscid when moist, smooth, pinkish-buff to orange-buff, fading in age to buff-brown, typically partially covered with a cottony white patch; flesh thick, white, not staining. Gills close, white, sometimes with pinkish tones in age, attachment variable: free to slightly adnate or adnexed. Stipe 4-11 cm tall, 1.0-2.5 cm thick, equal or tapering to a enlarged base; surface white, smooth to pruinose above, sometimes scaly below, partial veil absent but a velar scar or zone may be present; universal veil forming a membranous, white cup-like volva at the base. Spores 8.5-12 x 7-11 µm, elliptical, smooth, nonamyloid; spore print white. Solitary to scattered under hardwoods during the spring; in our area associated Quercus agrifolia (California Liveoak). 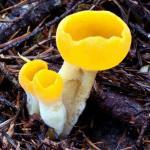 Edible and excellent, but not often recommended due to the possibility of confusion with deadly Amanitas, e.g. Amanita ocreata, which also fruits with California Liveoak in the spring. Amanita velosa is one of our more attractive and distinctive Amanitas. It is recognized by a pinkish-buff to orange-buff, cap, usually partially covered by a conspicuous white universal veil patch, a striate cap margin, and the absence of an annulus. 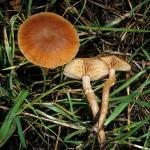 It is most likely to be confused with another spring Amanita, A. novinupta, which also has a pinkish-brown cap, but the latter has warts rather a cottony cap patch, and has an annulus. Amanita ocreata, a deadly species, is white to cream-colored, but may become pale-buff in age, thus the possible confusion with A. velosa. 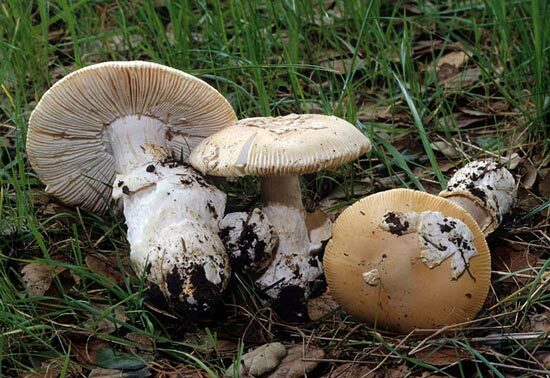 Amanita ocreata can however, be distinguished by the presence of an annulus, usually the lack of cottony cap patch, non-striate cap margin, and a thin sac-like rather than thick membranous volva.